Howdy folks. I was fishing yesterday just drifting the grass flats and picking off trout. When I was heading in I stopped at a channel marker and lo and behold there was a big cobia hanging out. I quickly threw my gulp shrimp at him he took a sniff and wasn't interested. I quickly threw a mirrolure at him same thing. Took four shots at him then he took off. Is live bait the way to go for them? Or is there a good artificial they will take? :huh Either way it was cool seeing one. 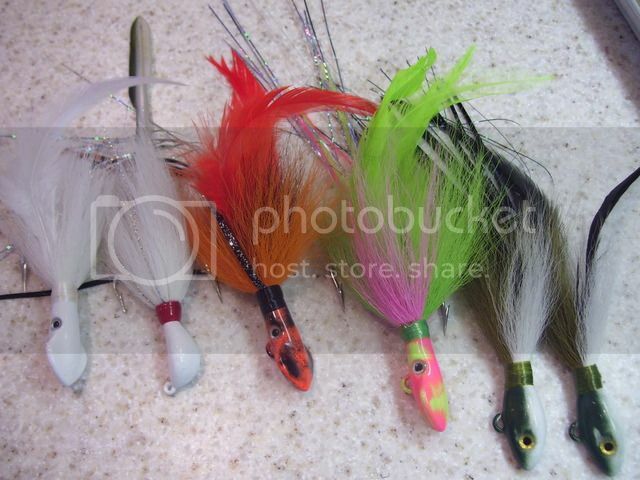 I have caught them on bucktails. 1 oz or bigger. Throw them a cobia jig or two. Some times they just don't want to eat, other times they will eat anything. If I had that happen, I would have got two shallow trolling lures ready and trolled around that whole area. That would have fired him up! I caught one on a Gulp shrimp under a popping cork once. He tried to eat the bobber 3 times before he found the shrimp. Sounds like you might have found one that just wasn't too interested in eating. They supposedly like to eat eels so many people throw a soft plastic eel. I actually bought a 1/2 jighead and plan to use some big bass fishing worms for this purpose. They like pinfish and catfish for life baits. Sometimes they aren't interested in artificials... that's why its nice to have a live pinfish on the boat. Even better... keep a live crab. You just need one! I know it is surprising that I would be using a top water lure, but I have caught legal Cobia on a Skitterwalk at Tin Pan and had some real fun netting it in that strong current by myself. Now that you mention it. I forgot that I caught an undersized cobia (32" :banghead) on the flats with a trout rod. It was also on a gulp new penny shrimp. I keep a 20lb rod, 50lb leader with a yellow bucktail on the boat at all times for cobia. It catches grouper also. yep. yellow bucktail is the charm. Tripletail,when home will eat thos gulps, though. Im picking up a spinfisher 8500v with a nice 7ft heavy action for the cobia if I see them again and grouper. I'll pick up some of those jogs too. Thanks for the tips! I'll be better prepared next time. 10 to 12" rubber worm when all else fails. They seldom turn down an eel. You can add it to the jig but it will sink out of sight if it's heavy and it makes it tough to see how the cobia is reacting . I like a 3/8oz so I can keep it in sight.